Not too long ago my Mother in-law made a wonderful meal of spaghetti and meatballs. But these weren't just any meatballs. No, these were different because she made them from pork and beef --- half & half. Wow. Normally when we've had meatballs in the past, we've always used 100% beef, and I've always liked it. But this time, with the pork, it was truly outstanding. One thing though: it has to be the right pork. Our pork tastes different than grocery-store pork, and in my opinion is far superior --- and far healthier. Anyway, that's another story. 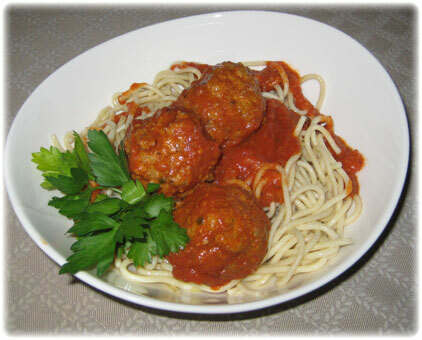 Meanwhile here's the recipe --- if you like meatballs, you've got to try it! Then add 2 liters tomato puree, and bring mixture to boil ---simmer for approximately 20 minutes. Then place the uncooked meatballs into the sauce and simmer for 30-40 minutes.